IN MY BOOK is a line of eighteen unique cards that combine greeting card and bookmark together in one package, envelope included. They make the perfect add-on to the gift of a book in addition to being a delightful birthday, congratulations or thank you note for all your book-loving friends. IN MY BOOK cards are printed on heavy-duty watercolor paper and feature wonderful drawings by book illustrator Meredith Hamilton. They are sold with a red envelope for mailing and are packaged in a cellophane sleeve. The cards recycle from greeting card to bookmark (they perforate), and as such are a long-lasting reminder of the giver (you!). All 18 styles begin with the greeting “In my book…” and conclude with such sentiments as “you’re novel”, “you’re the last word”, “you’re top shelf” and "you're out of this world". What's In My Book? It's "the greeting card and bookmark in one"! Hit the FIND BOOKS button to see all eighteen styles. Please choose carefully as cards are not returnable. 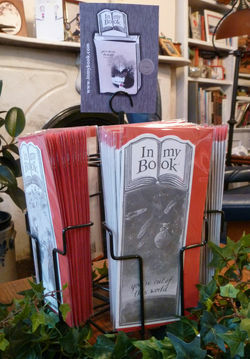 But they are recyclable; from a greeting card they turn into a bookmark...the perfect choice with the gift of a book.